M&E Engineers worked intimately with NK Architects on the renovation of a former warehouse and production space into their new corporate North American Headquarters. Project was staged to allow for the building to be fully functional throughout the renovation process. A variety of HVAC system approaches were modeled and subjected to a life-cycle cost analysis to determine the best approach for the new building. An Integrated Automation System monitors and controls the HVAC, lighting, and security/access control systems. This project received the Distinguished Engineering Award from the New Jersey Alliance for Action, was built to LEED standards, and boasts an Energy Star score of 87. Munich ReAmerica is one of the top providers of property and casualty reinsurance in the United States. M&E Engineers utilized an energy model to analyze multiple options in replacing air-cooled chillers with traditional air-cooled, evaporative-cooled or water cooled options. Design consisted of two 140 ton chillers, and incorporated structural support changes, piping modifications and an update of the building control system. Munich Re received a First Place Award from the New Jersey chapter of Building Owners & Managers Association (BOMA) in the Energy Reduction category for New Jersey Office Buildings for lowering energy consumption at its four building USA headquarters by 35% from the previous year. Realogy Holdings (one of the world's largest franchisors and the parent company of Century 21, ERA, Coldwell Banker, Sotheby's International Realty, etc.) made the decision to relocate its global headquarters to a new 15 acre campus located in Madison, NJ, that includes a 270,000 square foot facility, for which Realogy is the only tenant. .
M&E Engineers managed the commissioning process for the energy consuming systems for this tenant improvement project. The project achieved a LEED Gold certification under the Commercial Interiors rating system. In 1928, New Jersey Bell erected its twenty story headquarters building in the burgeoning downtown area of Newark, NJ. 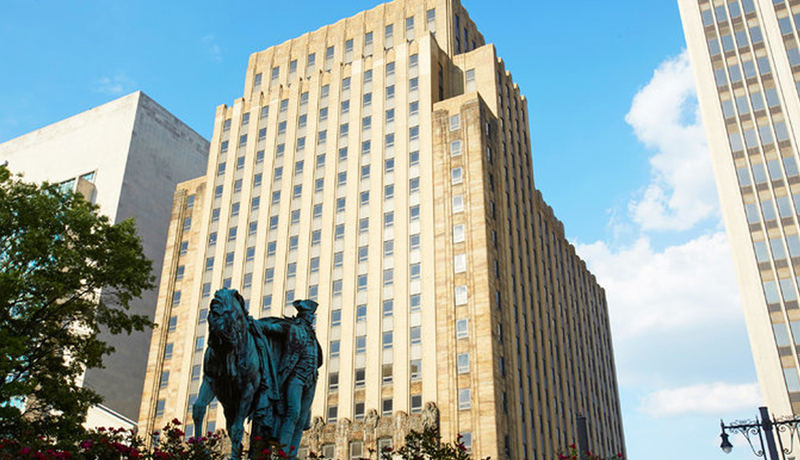 Some 70 years later, M&E Engineers received commission to renovate this historic structure into a 21st century, state-of-the-art, efficient office complex. M&E was instrumental in the planning, design and execution of this $50M renovation project. M&E designed new HVAC systems, replaced much of the plumbing, and provided all new electrical distribution systems. M&E developed a plan that allowed this to be done while the building was continuously occupied. In addition, we obtained over $250,000 in Smart Start energy rebates for the owner.